In a very general sort of way, I dislike books like Veganize This! (DaCapo) because, rather than celebrating all that can be really wonderful and freeing about the vegan lifestyle, it serves to make what is an a lternative way of eating seem like a freakish aberration to be gotten around. 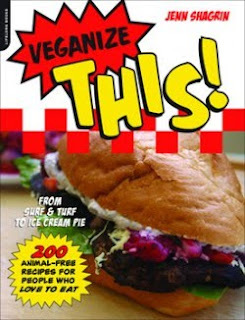 The subtitle tells that story: “From Surf and Turf to Ice Cream Pie: 200 Animal-Free Recipes for People Who Love to Eat.” And, fair enough: there are people for whom vegan choices are entirely social or moral and who miss what they no longer have. My own approach to vegan and vegetarian cooking tends to be one of celebration for what is rather than intense focus on what isn’t. And there are lots of cookbook authors who agree with that approach: increasingly, their beautiful books become more and more available. Actress, comedienne and vegan chef Jenn Shagrin has a different approach and her book seems to celebrate food in disguise as other food. Vegan Veal Chops with Sunchoke Caponata. Tofu Scallops. Even Vegan Twinkies. Shagrin uses a small arsenal to fake her way to delicious results: her recipes tend to be heavy on seitan -- a wheat gluten-based meat substitute -- as well as several commercial ingredients.